chow with chow: wham! bam! thank you lamb! 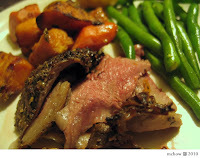 - lamb is sheep meat that is less than 12 months old. - baby lamb is meat from a 6-8 weeks old sheep raised on milk (a redundant term, cause lambs are baby sheep). - hogget is sheep meat that no more than two permanent incisors. - mutton is sheep meat that has two or more permanent incisors grown in. anyways, all of them come from our adorably delectable ovine friends [insert corny lamb joke here] and they are all tasty in their own way, be it the variety of sheep or cut of meat. anyways... basic preparation is pretty simple (remove excess visible fat and any visible sinewy crap), then season and cook. let the rub sit for a good hour or two, if not four or overnight. roast as you would any other piece of meat, until the internal temperature reads what you want it to (145F for rare, 160F for medium). try spicing it up with chipotle or cayenne, or substituting the honey with brown sugar or maple syrup (or omitting the sweet stuff all together), or you can even dress it up to look like harpo marx! the world is your lamb! that eat the seasons website is neat. thanks chow with chow!